You spend your business day multi-tasking – why shouldn’t your commercial hot water system do the same? Introducing the Demand Duo™ – the perfect solution for direct replacement of most traditional standard and high efficiency commercial tanks. And Rinnai backs it’s nearly 100-year reputation of quality and reliability with a 6-year HEX/Tank warranty. The all new Rinnai Demand Duo™ is a master multi-tasker you’re sure to admire. 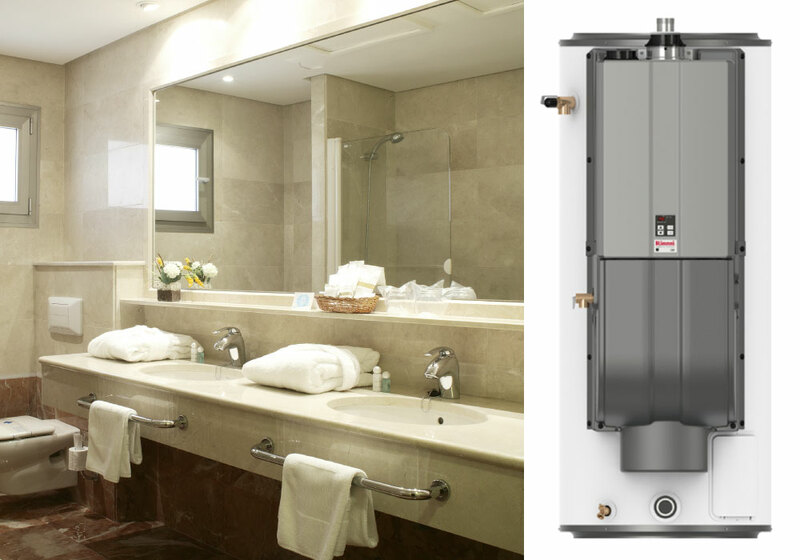 Combining the on-demand, continuous supply technology of the Rinnai C199 tankless with an energy efficient and durable 119-gallon storage tank, the Demand Duo™ provides more water-heating capacity than a traditional tank in the first hour. The result: Hot water is available to keep pace with demand – from short-period, high-spike draws, to a supply that’s ready to go the distance, day in and day out. Equipped with the all new C199 Tankless Water Heater which is Commercial ENERGY STAR® certified, has 96 percent thermal efficiency, 199,000 BTU, fueled by either Natural Gas or Propane, the Demand Duo™ produces consistent water temperatures for predictably smooth business operations. Optimum performance is achieved by efficient tank recovery methods so you can count on having hot water even during reheat cycles. 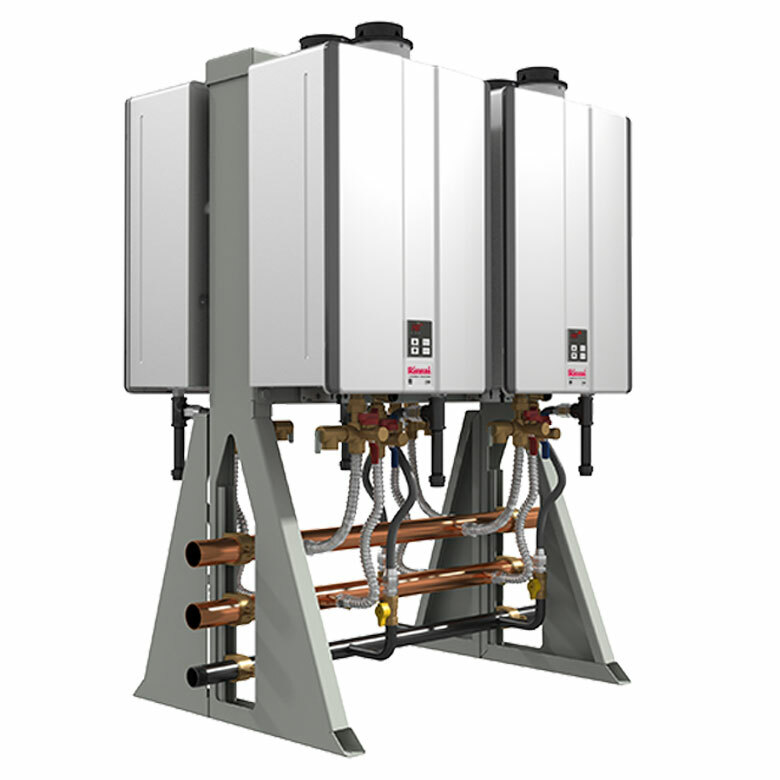 With the ability to install multiple Demand Duos™ together, we create redundancy that keeps hot water flowing – and your business going. The effort to keep hot water availability and business uptime high doesn’t stop with the hybrid system itself. The Demand Duo™ can also tie into a building management system with the DPS/MIS accessory, sending alerts when the system needs attention. In addition, the maintenance alert system on the Rinnai built-in controller provides peace-of-mind monitoring protection to put the efficiency and performance of your hot water on cruise control. Thanks to our flexible venting options and Tankless Rack System, as well as solutions that are custom designed (with and without storage), you can use multiple units together to provide anywhere from 15,200 to 4.9 million BTU – enough to replace even large boilers. 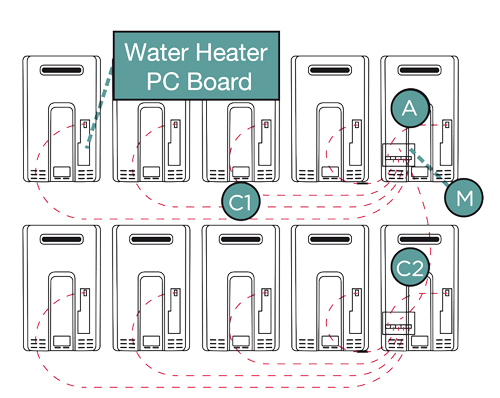 In the diagram below, 10 tankless water heaters are electronically connected. Each bank of five is controlled by a Multi-System Control Board. These boards are connected to each other with Multi-System C2 cables. One Multi-System Control Board will serve as the master control for the entire system.